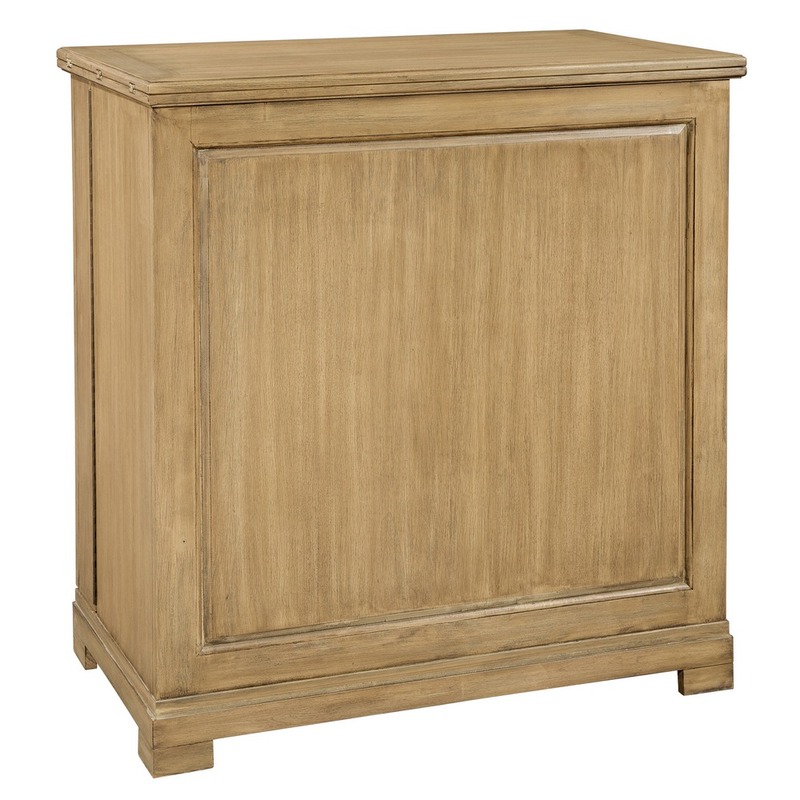 Features a weathered, Driftwood finish inspired by the natural yet rustic nature of reclaimed woods on select hardwoods and veneers. This portable, Hide-a-Bar cabinet is finished on all sides and features cane mesh panels on the two front doors and a veneered flat panel on the back. 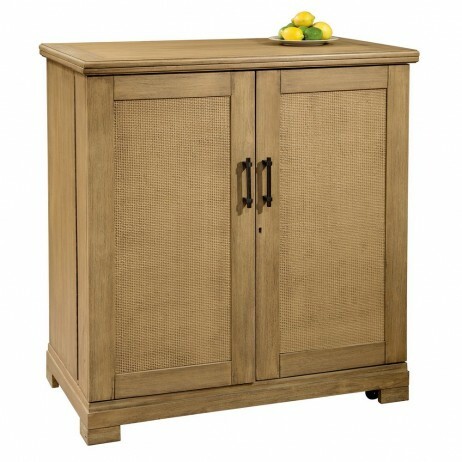 The doors feature distinctive antique bronze finished handles. 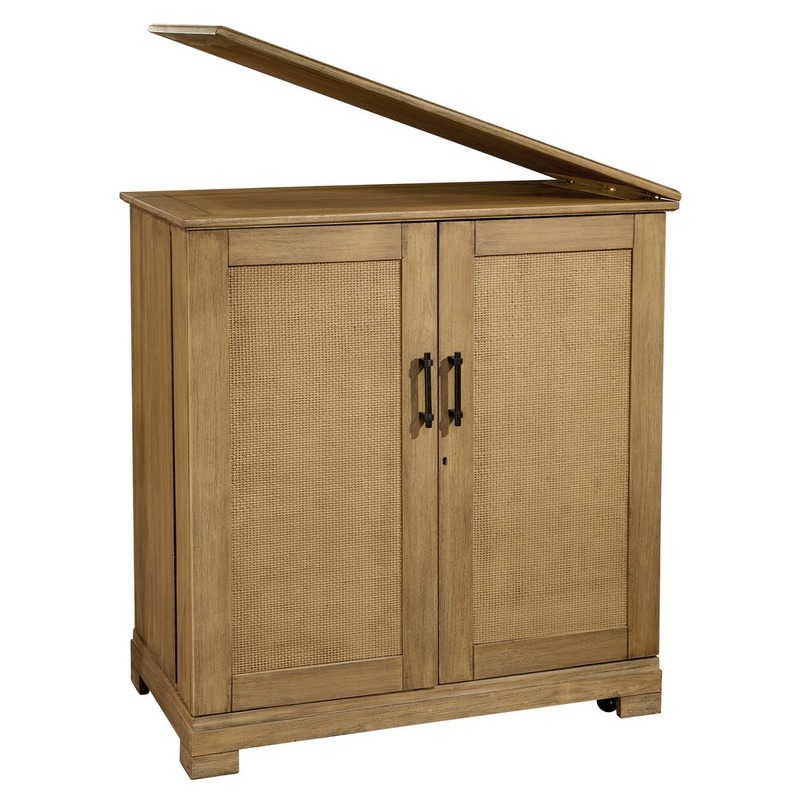 The top opens up and slides to the left, expanding to 77 inches and providing increased space for entertaining. 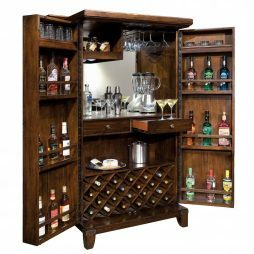 Random wood-planked doors with arched detailing and metal handles give the Rogue Valley Rustic Wine and Home Bar Cabinet its’ unique appeal. With space for generous liquor storage, 22 bottles of wine, stemware, etc. this cabinet has something for everyone. It even has 2 drawers for utensils! 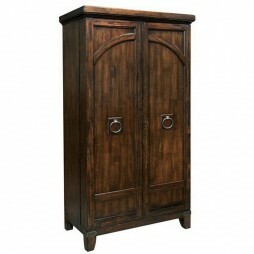 This beautiful piece is finished in Rustic Hardwood with heavy, artistic distressing. it offers laminated, lift-up shelves, interior lighting, a mirrored glass back in the upper cabinet and 180 degree door hinges for easy serving. 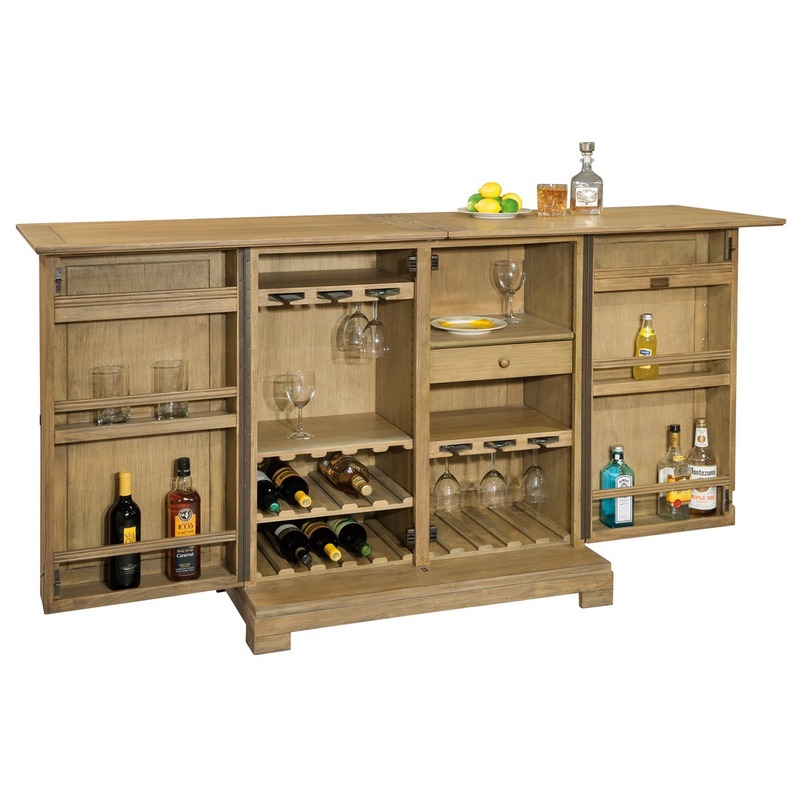 Topped with rare Italian marble, the Niagara Home Bar is just gorgeous! Beginning with the Demilune (half-moon) shape, the features continue with sunburst veneers and heavily carved columns and feet. 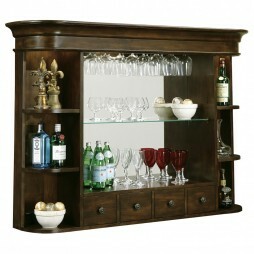 The bar is finished in distressed Rustic Cherry over select hardwoods and veneers. The interior features a hanging stemware rack, wine racks, center pull-out shelf, storage for spirits, and insulated stainless steel bins for chilling wine and condiments. 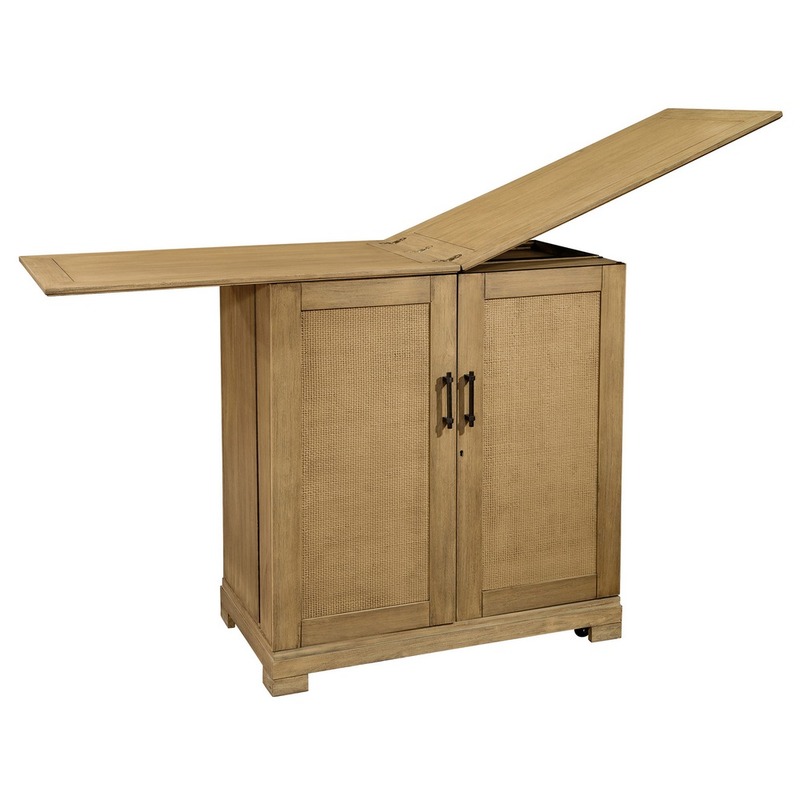 The side-hinged top drawers feature dovetailed construction with metal roller guides and lock into position. A black granite cutting board fits inside the top drawer. 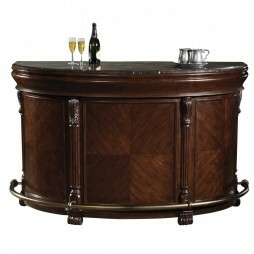 Additional features include a locking door and a curved antique brass-tone footrest following the curvature of the bar. The laminated marble top is easily removed for handling. Beautiful! 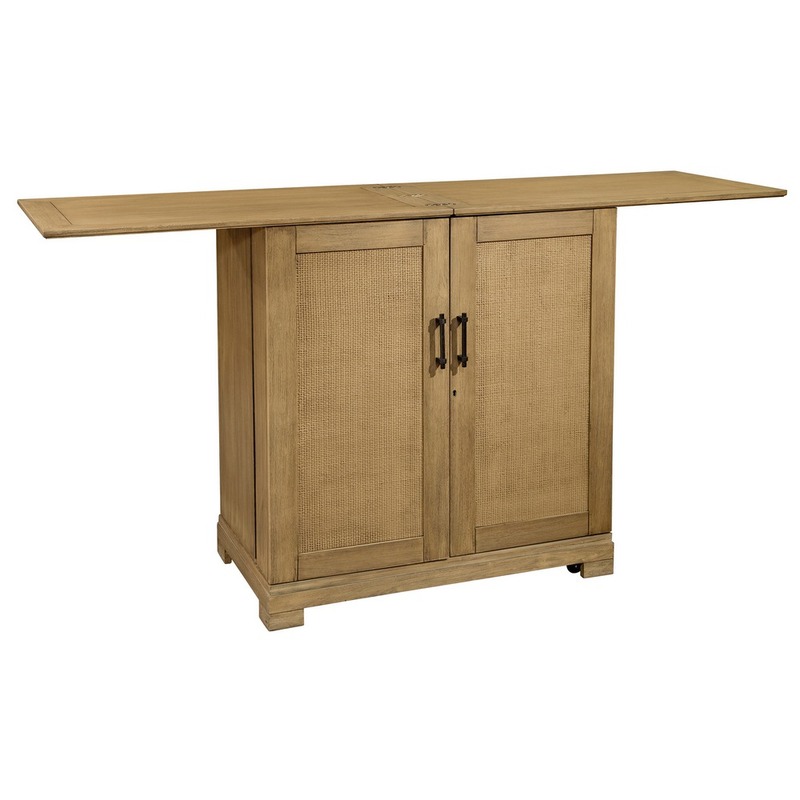 Add to beauty of the Niagara Home Bar Console 693-006 with the Niagara Home Bar Hutch. This graceful back bar features soft, rounded corners, a glass mirrored back, and three incandescent lights to illuminate your collectibles. The No-Reach light switch is located on the back of the cabinet. The center features a hanging stemware rack, a glass shelf and a wooden base display area, with four cubbie drawers for storage of smaller items such as corkscrews and bottle stoppers. The rounded side sections each feature two shelves in addition to the wooden base display area. 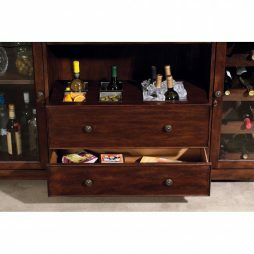 This piece is constructed from select hardwoods and veneers, finished in Rustic Cherry, and attaches to the bar console with two metal brackets. The Pad-Lock cushioned metal shelf clips increase stability and safety. The beautiful wrought iron scroll work legs and detailing make the Howard Miller Wine Rack/Butler a must-have for the wine enthusiast. 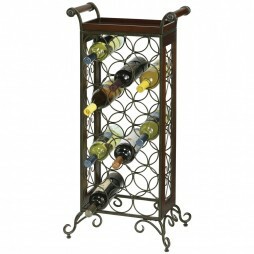 This rack is made of both wrought iron and metal and features a removable serving tray. The metal is finished in a warm gray and the wood framed sides and tray in American Cherry. This floor rack holds 21 bottles of wine and has adjustable levelers under each corner to provide stability on uneven and carpeted floors. Some assembly required.